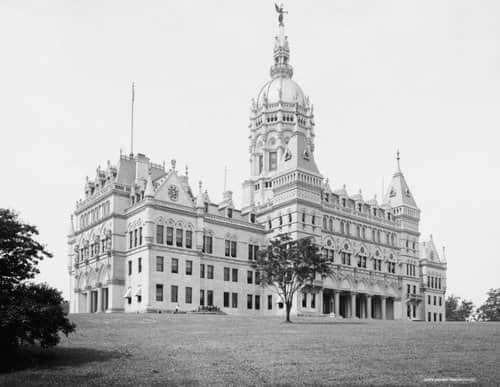 Connecticut Capitol Building Aesthetic Expression | John Canning & Co.
Up until the 1870’s, the seat of power in Connecticut was a single governing body, the State General Assembly, which met annually in either New Haven or Hartford. As the state grew, it became clear that a single, permanent home for the state legislature needed to be established. After a feverous debate, it was decided that Hartford would serve as the new state capitol. In 1871, the news of the proposed capitol building was announced and several architects submitted plans for the new space. 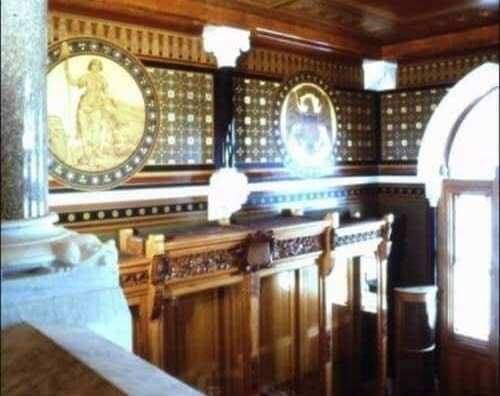 It was the work of Richard Mitchell Upjohn which was ultimately selected by the planning committee. The son of famed American Gothic Revival architect Richard Upjohn, R. M. Upjohn was officially appointed “Architect of the State House.” Ground was broken in 1872 and work was completed in 1878. Officially accepted by the Board of Capitol Commissioners in 1880, the Capitol as it stands today is a testament to the architectural vision Upjohn had. The exterior is distinctly crafted in the Second Empire style, replete with mansard roofs, metal cresting and dormers— hallmark characteristics associated with this movement. Contrasting the Second Empire style of the exterior is the striking Victorian Gothic interior. Embellished by William McPherson, the interior is decorated in the High Victorian Gothic Style, intricately adorned with complex diaper and running patterns and color pallets. McPherson’s interior work serves as one of the highest expressions of the Aesthetic Movement. At the age of 12, Scottish-born McPherson began his 9 year apprenticeship with Hayes of Edinburgh. Upon completing his education under a master craftsman, McPherson and his brother Walter immigrated to America in the early 1840’s and opened a craft studio in Boston. During the presidency of Ulysses S. Grant, McPherson was commissioned to complete a number of interior spaces within the Executive Office Building. By the time word got out about the new state capitol building, McPherson was an acclaimed decorator and competed successfully against 11 highly regarded firms for the contract to complete the interior design. While McPherson served as the principle figure overseeing the completion of the interior, other firms were contracted to complete various specialties throughout the building, such highly regarded Portier and & Stymus, who received the contract to complete the furniture and woodcarvings. 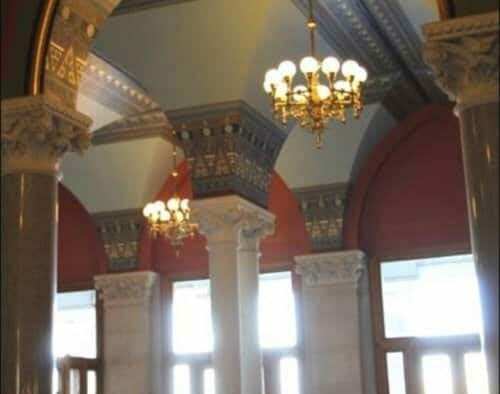 The designs seen within the Connecticut Capitol Building can best be described as the highest expression of the Aesthetic Movement Design. Characterized by a strictly tertiary color pallet and symmetrical design layout, a two-dimensional flat decoration scheme pervades. Highly stylized flower-and-leaf motifs, often outlined in black to remove any possibility of a third dimension are seen throughout, along with Moorish and Far East influences. What makes the building remarkable is in part the extent and intricacy of decoration but perhaps most remarkable is the consistency of the decoration motifs throughout the building. As generations come and go and the present en vogue style changes, impressions are left throughout a space, changing and altering its makeup. Free of such changes, the capitol building remains a pure homage to the Aesthetic movement. Though the interior and exterior remain distinctly different styles, McPherson echoed motifs from Upjohn’s plans, maintaining the respectful relationship between architecture and design. Notes of Upjohn’s work are echoed throughout the interior spaces and can be seen across materials, including marble, paint, and glass work. John Canning Studios was brought in during the 1980’s at the request of the state of Connecticut appointed architect Dominic Cimino to help provide insights into the condition of the building and to ultimately design and execute conservation and restoration work in multiple spaces. 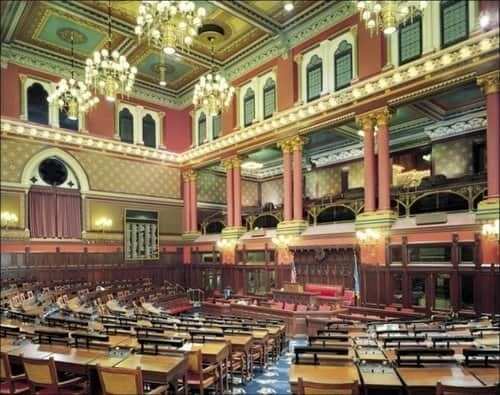 Make sure you stop by our blog next week to learn more about one of those spaces, the House Chamber.